I love the fringe on the sofa. I love the pattern of the rug. I love blue painted bookcases. I love large drum shade light fixture. I love the wall color. I love the fabric on the roman shade. I love nailhead detail on the brown leather chair. I have to ditto everything. I love the paintings hung on the bookcases. I wish I had a space like that in my own home to try it out!!! To continue your list... I love the way the frames are hung on the bookshelf and I love the lamp on the right. I like having one image listing what you like about it. I really love the color of the back of the bookcase. The royal blue. I love it all!! Can I move in? I love the wall color paired with the deeper blue in the bookshelves. Plus I feel this color combo could work well in all seasons too. the bookshelves and well, that lamp! I love too! so pretty! The drum shade light fixture and the painted book case for sure! I love the contrast between the wall color and the color of the back of the bookcases. Awesome room! I love the pillows and the large light in the center. 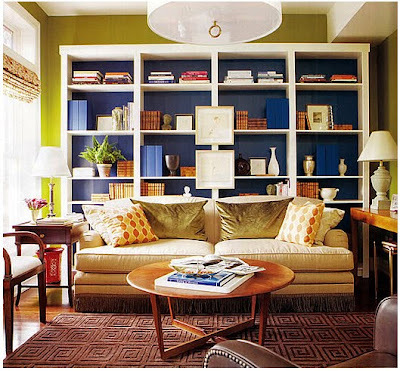 Now that your bookshelves are blue, are you going with the green on the walls? Great colors! Exactly what you said. I love it all! i love the wall colour best! I like the way they hung art on the bookcase, and I love the style of the couch and the throw pillows. I have a giveaway on my blog, with pillows that would work in this room! The bookcase looks like yours! Was this one of your inspiration pieces?! I love just about everything. I do love the color of the walls. I agree too! The blue book shelf is fab. Love the blue in the bookshelves! It's such a pretty shade! I'm with Paula... Love the two prints hung out in front. And the bookshelves look great overall! i love the blue in the bookcases.